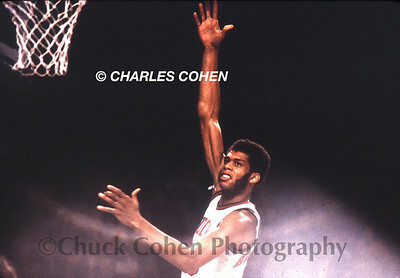 I took this photo in 1972, in Milwaukee. 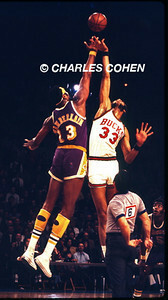 The Classic Confrontation, Wilt vs Kareem, the two greatest scorers in NBA History. 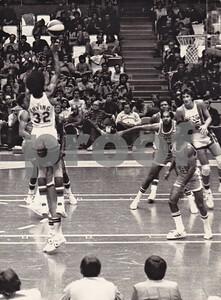 That's Pat Riley #12 under the hoop and on the left edge is Jerry West's profile. 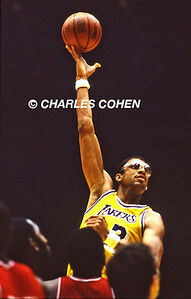 This was Wilt's last season in the NBA. 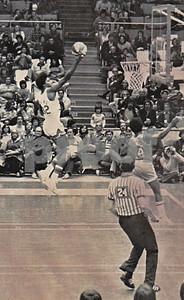 The camera I took this with, my Minolta, was a single shot camera, I did not have a motor drive. 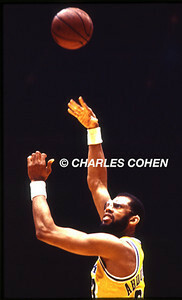 Jump Ball to open game, 1972, Milwaukee Arena, Wilt Chamberlain vs. Kareem Abdul-Jabbar. 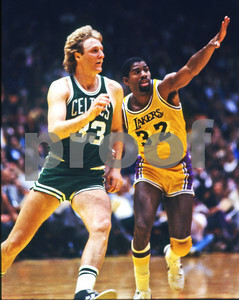 The ref is soooo tiny but threw up a good ball. 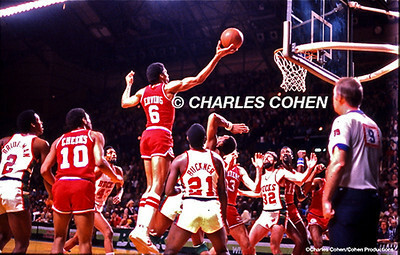 The Great Dr. J., Julius Erving, finger rolls over Milwaukee Bucks Bob Lanier as others look on seemingly in awe of either the amazing Erving or the "ball" as a "magic orb." 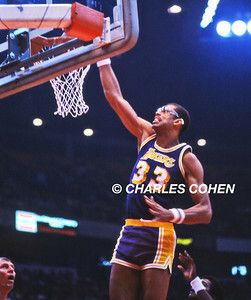 The Great Kareem Abdul-Jabbar and his unstoppable weapon, the sky-hook. 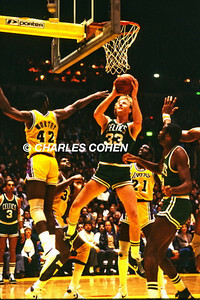 Celtics Larry Bird makes short bank shot vs James Worthy and Lakers during NBA Finals playoff game as #21 Michael Cooper and Celtics Cornbread Maxwell look on. 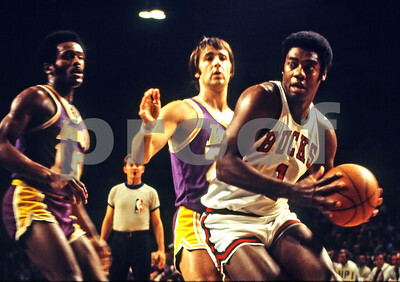 The Big O, Oscar Robertson, guarded by Gail Goodrich and Mark Price. 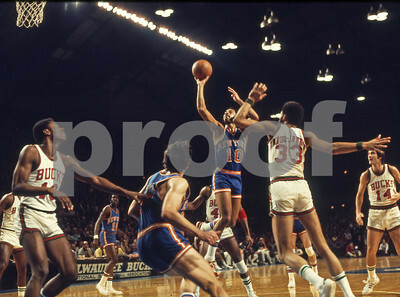 1972, Milwaukee Arena. 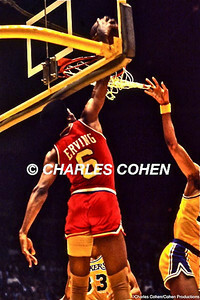 Sixers Julius Erving dunks over Abdul-Jabbar in 1983 NBA Finals at the LA Forum. 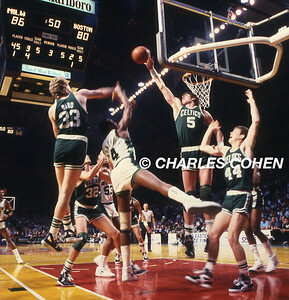 Celtics Bill Walton and Larry Bird double block the Milwaukee Bucks Sidney Moncreif as #44 Danny Ainge looks on. 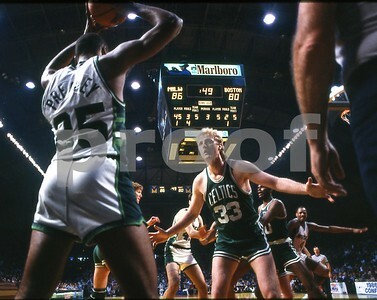 Danny Ainge is now the Celtics General Manager. 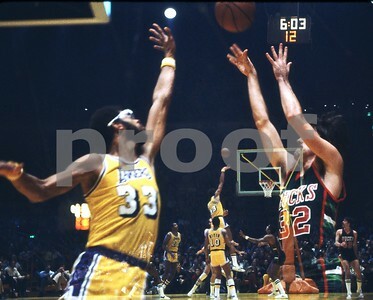 This shot taken during a playoff game. 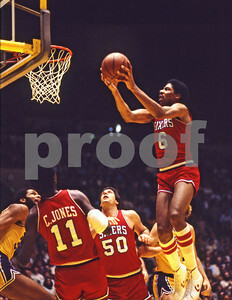 The Incomparable Dr J, Julius Erving, goes airborne vs Jabbar in LA Forum, 1983 NBA Finals. 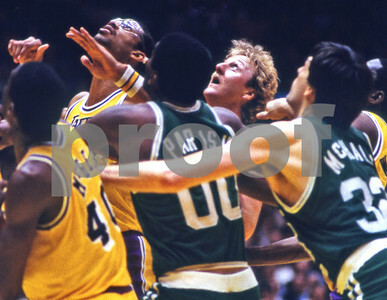 The Infamous Punch...Los Angeles Lakers Kermit Washington punches the Houston Rockets Rudy Tomjanovich in LA Forum on Dec.9, 1977. 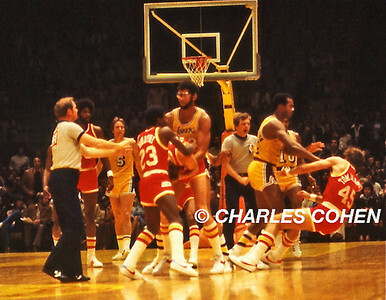 Abdul-Jabbar holds onto a Houston Rocket who's bent over and holding his face as #23 Calvin Murphy attempts to calm them down. 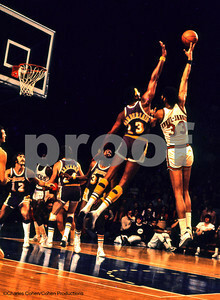 Adbul-Jabbar dunks over the Denver Nuggets Dan Issel in Denver. 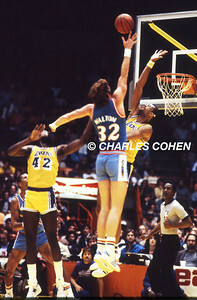 The San Diego Clippers Bill Walton puts up a finger roll over the L.A. Lakers Kareem Abdul-Jabbar as James Worthy looks on. 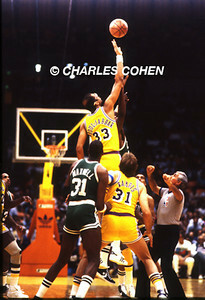 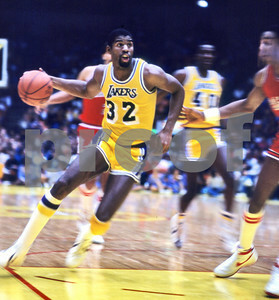 Lakers Abdul-Jabbar controls the tip vs Celtics Robert Parrish as Cornbread Maxwell and Kurt Rambis jockey for position to begin NBA Finals. 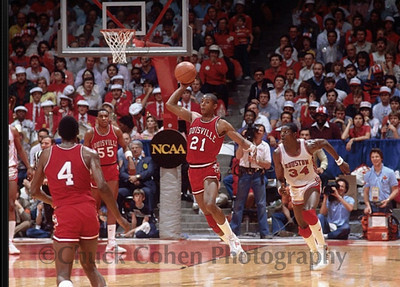 1983 FINAL FOUR: Semi-Final Game, #34 NBA Hall of Famer Hakeem Olajuwon's team beat Louisville and then lost to Jim Valvano's North Carolina State team in an historic final...and the cameraman to the right of Hakeem sitting on the court filming the action in a blue sport shirt is Chuck Cohen, working for NCAA Productions. 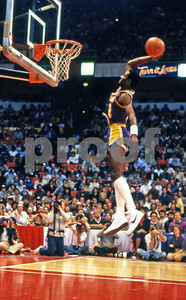 Lakers Michael Cooper dunks in Denver. 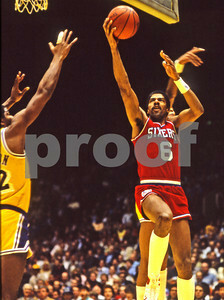 Magic drives the hoop vs Sixers in 1983 NBA Finals.